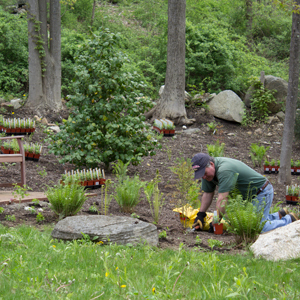 June 2014 - Ann's Place was honored, once again, to host a small team of dedicated volunteers from GE Capital. 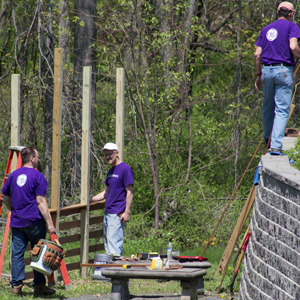 Over the course of two days in May GE volunteers assisted Erik Keller, Ann's Place Horticultural Therapist, in the construction of a new arbor adjacent to our Labyrinth. 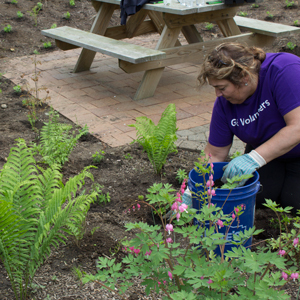 They also assisted in a variety of gardening tasks around the grounds including the planting of nearly 900 sweet woodruff plugs, over 30 hops plants, four american wisteria and cleaned, and weeded the grounds. Thanks to everyone involved!